Focus: We utilize innovative sensory regulation techniques, animal assisted therapy, vocational training and expressive arts to meet each student's individual needs while providing endless opportunities for exploration, growth and independence. Meadowridge Academy is a comprehensive therapeutic residential school located on 6.2 acres in rural MA. Students range from low to average and high cognitive functioning, and may have learning disabilities as well as medical fragility. Meadowridge Academy strives to make a positive difference in the lives of our students through individualized care and strengths based, trauma informed treatment. We use the ARC model to help students build positive relationships, learn and practice self regulation skills, and transform their individual interests into sources of strength, resiliency and success. We partner with families and communities to meet each student's individual needs while providing endless opportunities for exploration, growth and independence. We provide comprehensive treatment through a multidisciplinary team approach that includes clinical, educational, vocational, residential, psychiatric and nursing services. Our unique focus on sensory regulation, vocational training and animal assisted interventions are integral in the success of our students. Watch the video to learn more about Meadowridge Academy! James Falvey made his way to JRI in 2008 when he accepted a position as a Residential Counselor at the Walden Street School in Concord, MA. Very early on, he realized this is something he enjoyed and felt successful helping the youth develop new skills and ways to manage very difficult emotions. He was promoted within the Residential Department several times where his focus became helping to teach and develop new skills in his staff members. He left JRI in 2011 but returned 8 months later after being offered an administrative role at the Walden Street School. During his time as an administrator, first as Residential Director, then as Director of Operations in 2014 followed by Assistant Program Director in 2015, he was influential in developing programming that built rituals at the Walden Street School that have become tradition and a part of the community culture. Professionally, James was honored in 2013 to be named a Master trainer for the agency in the Building Communities of Care model. In 2015, he returned to school and earned his Bachelor’s Degree in Sociology. James is currently enrolled in a Master’s Program in Special Education at Framingham State University. Jenell Richard, RN works as the Nursing Director at Meadowridge Academy. Ms. Richard earned her Bachelors of Science degree in Nursing at the University of Massachusetts in Boston in 2008. She has been working for JRI since 2009, where she has learned to care for student’s medical needs, while understanding complex trauma within a residential setting. She enjoys working closely with the Psychiatrist to provide psychiatric care that is tailored to each individual student. She is passionate about seeing the students recognize their potential and watching them grow and succeed at Meadowridge Academy. Michael started working at Meadowridge Academy is September 2014. He graduated from Rhode Island College and is currently working on his Masters at SNHU. Through sixteen years of employment at the YMCA, he developed a passion for working with children. Michael has experience developing Special Needs Summer Camp programs and has taught at every level (pre-school - high school). He is also an avid golfer and Varsity Ice Hockey Coach. Peter Gray originally joined JRI as a residential counselor. In this role he learned the importance of helping students develop their identity through positive engagement and support. Peter was lucky enough to become the Director of Competency Services at Meadowridge Academy, where he helps students identify strengths they would like to expand upon in the pursuit of building a stronger sense of character and a skill set that will serve them as they transition in to adulthood. Peter has a B.F.A from Ithaca college and is currently an M.S.W. candidate at Boston University. Through a combination of creative arts training and a burgeoning clinical training he has been excited to implement fully immersive competency programming that helps students develop tools ranging from socialization to independent living skills and career training. Peter is excited to continue his journey of creativity and support at Meadowridge Academy. Erin Lunn began her career with JRI as a clinician at Meadowridge Academy after receiving her master’s degree in clinical social work from Simmons School of Social Work. In this role, Erin provided trauma informed care to young people and their families. Erin has built upon her passion working with families and has discovered a newfound interest in animal assisted therapy. She has developed upon her skills supporting clinicians and interns through their work with students and families, which has led Erin to her current role as the Assistant Director of Clinical Services at Meadowridge Academy. Brianna Caito began her career with JRI as a residential counselor in the Spring of 2014. In this role, Brianna provided direct care to adolescents and helped them on their individual journeys by teaching them skills and developing their strengths. Since then, Brianna has gone on to earn her masters degree in Mental Health Counseling, at Suffolk University and has joined the clinical team at Meadowridge Academy. In this role, Brianna provides clinically based, trauma-informed, treatment to students and their families. During her time with JRI, Brianna has quickly developed a passion for providing trauma-informed therapy to students and their families in hopes of supporting them as they navigate through their complex and difficult journeys. These experiences have ignited a desire to enhance her clinical career in the future, and to continue fostering her ability to provide the best, most informed trauma-focused therapy to her students. Brianna looks forward to furthering her career with JRI and Meadowridge Academy in the future. Eryn Maschek began her career with JRI as a masters level clinician after receiving her Masters of Arts in Mental Health Counseling and Behavioral Medicine degree from Boston University School of Medicine. In this role, Eryn works to facilitate a therapeutic trauma informed environment. Eryn is currently working towards her independent state licensure (LMHC), and has particular interests in substance abuse treatment and dual diagnosis. She is working towards her ACRA certification in order to expand her knowledge base in this area. Eryn developed her passion for trauma treatment and working with adolescents in the early years of her career as a sexual assault counselor. This work inspired Eryn to further her career in the trauma field and support students in fostering their resilience through adversity. This lead Eryn to her current role as Clinician at Meadowridge Academy. Philip Ndegwa attended Siena College for his BA in psychology. After graduating and working as a program counselor for Adults with mental disabilities, He attended William James College where he focused on clinical mental health with a concentration in Couples and Family therapy and an emphasis on African and Caribbean Mental health. Phil’s passion for working with the students at Meadowridge has been a great asset in building his therapeutic techniques and skill. He has always used his high energy and willingness to be silly as a point of connection with his students. Phil’s passion around helping families identify and resolve multigenerational trauma continued to inspire him to work with adolescents who are beginning to find their identity outside of their families. Meadowridge Academy, and JRI as an organization, has been able to provide the professional and personal development outlets to encourage his mission. Phil’s goal in the mental health field is to not only fill the need for professional men of color, but to break the stigma of mental health in communities of color and assist in providing mental healthcare to this immensely underserved population. Traci Rigano began her career with JRI as a licensed clinical social worker after receiving her masters at Simmons College School of Social Work. In the role of a clinician, Traci provides direct treatment to students and their families utilizing SMART, trauma informed therapy and Animal Assistant Therapy. Traci has always had a passion for working with children and their families at an early age to help rebuild their stories and to develop hope for whose who have lost it. This passion drives Traci every day to give her children and families the treatment that they deserve. Traci is looking forward to building her clinical experiences with Meadowridge and JRI as a whole. Joanna Stumper began her career with JRI as an occupational therapist in the group homes division after graduating with her Master of Science in Occupational Therapy from Boston University in 2014. In this role, Joanna worked in close collaboration with clinical teams to develop OT programming and assessment processes for individual clients. Staff training has also been a significant part of her role, to broaden understanding of OT interventions and effective individualized sensory based plans. Over her time with JRI, Joanna has also become a trainer in ARC, suicide prevention and PFA. Joanna’s role has evolved to include both group homes and Meadowridge Academy, where she is currently able to combine residential, educational, sensory based and staff training components in occupational therapy interventions. Joanna developed a passion for working with transition age youth during graduate school and was eager to join JRI in a role working with adolescents upon completion of her degree. Developing a thorough understanding of trauma informed care has been a priority for her, and engaging in research, community presentations, and trainings has been integral to this goal. Joanna also belongs to network of pediatric mental health occupational therapists in the greater Boston area order to remain connected to evidence based, best practice methods. Chelsey Holland began her career at JRI as a master’s level clinician after receiving her masters at Simmons College School of Social Work, with an emphasis on children and family services. In this role, Chelsey provides direct treatment to children and their families by utilizing trauma informed therapy and SMART therapy. Chelsey has always had a passion for supporting children and their families through challenging situations, while teaching them to recognize their own innate strengths and resilience. Chelsey is looking forward to continuing to follow her passion of providing children and families with the best treatment possible, while building upon her clinical skillset with JRI. Emily began her career for JRI as the Competency Coordinator at Meadowridge Academy. Emily has a passion for helping students utilize their skills to pursue a fulfilling future. Emily is inspired by helping children rewrite their stories and embody resilience. In her role, Emily enjoys aiding students in their progress as they learn about themselves, their interests, and their goals. Emily earned a B.S. in Clinical Psychology in 2014. She since has worked in both clinical and research settings. Emily has an interest in the ways in which different cultures treat mental health and spent time studying Buddhism abroad in Thailand. Emily is also a registered yoga teacher with a focus on Chinese Medicine. Emily utilizes this knowledge to create a well rounded approach toward clinical interventions. Emily is looking forward to furthering her experience and building upon her skillset at JRI while pursuing graduate level work. Students attend school on campus, year round and have a full day of academic and vocational training. While the curriculum is challenging, modifications are made to meet the individual needs of each student and classrooms are designed to be small with additional academic support and assistance. In addition to the academic curriculum the students enjoy physical education, life-skills and vocational training in woodworking, animal care, horticulture and expressive arts. Meadowridge Academy offers intensive and individualized clinical services and interventions. Through the ARC model, Clinicians help students build positive attachments, self regulation skills and competency. Clinicians utilize a variety of trauma informed techniques, including Sensory Motor Arousal Regulation Treatment (SMART), which is an evidence-based practice, Neurofeedback, Dialectical Behavioral Therapy (DBT), and Animal Assisted Interventions (AAI) to guide students in processing trauma history and developing positive skills to manage difficult emotions. In addition to individual, family and group therapies, we help each student develop their individual interests and talents into areas of competency. This may include, but is not limited to, off campus vocational experience in the form of internships, apprenticeships and volunteer work. 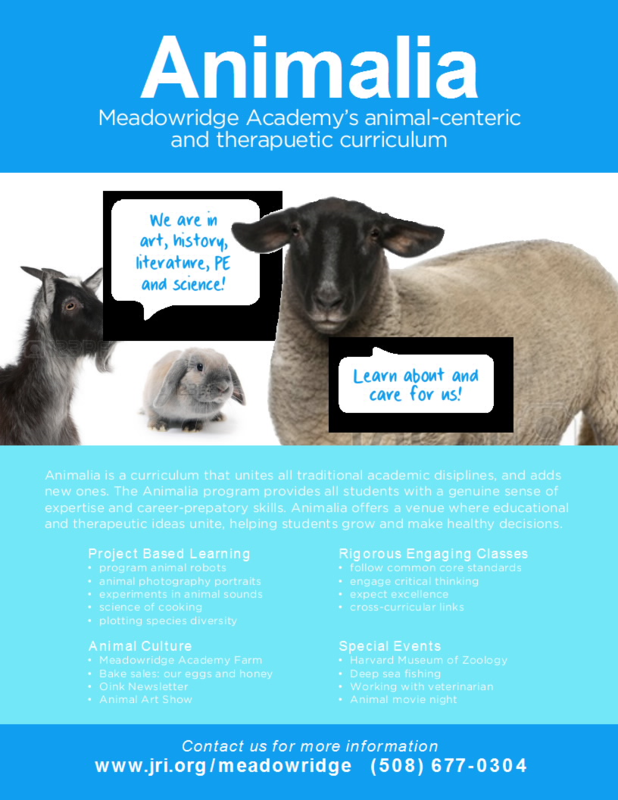 Meadowridge Academy students have the unique opportunity to engage in parallel work through use of the animals on campus. Research shows that adolescents who experienced developmental trauma have significant difficulty accessing their frontal lobe due to it being underdeveloped. Through use of the animals on campus, students are able to self and co-regulate their energy and emotions, and slowly bring their frontal lobes back online. 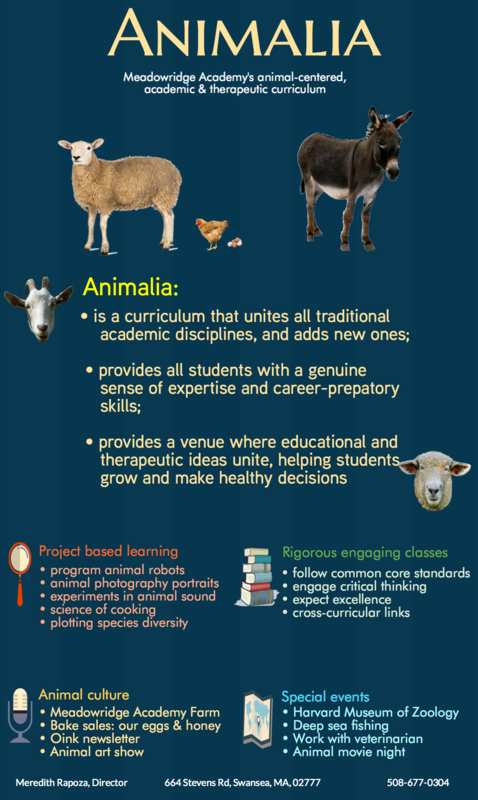 Simultaneously, students strengthen vocational and self-care skills and begin to develop a positive sense of self through building responsibility by working with the animals. For Meadowridge Academy students who have limited interpersonal skills and lack the ability to engage in traditional talk therapy session, parallel work is incorporated during session where students discus their emotions through the animals. This provides Clinicians the opportunity to engage in trauma-focused interventions to build off of these statements and provide the students with better clinical treatment.